The heretics known as the Cathars, sometimes called the Albigenses, arose some time before 1200 and effectively ceased to exist by about 1330. The centre of their activity was mainly in the Languedoc region of southwestern France, in the triangle of land between the Pyrenees and the Mediterranean. The doctrinal differences with the Catholic Church do not seem to have been dramatic. They were Christians who based their beliefs on their reading of the Bible, which, admittedly, was something that was in itself bad enough for the Catholic Church. What singled them out for the dedicated attention of the Church was the Cathar's modest, pious and ascetic 'priesthood', which was popular with the local people of all levels in a time of unrest over the ever more rapacious demands of the Church to finance its excesses. It would be no different two centuries later in Luther's time, when most of the discontent with the Catholic Church arose from its ostentation and greed: it was moral and financial, not doctrinal discontent. The corruption, simony and sheer venality of the priesthood from its lowest to its highest levels was visible to everyone who had eyes to see. The contrast with the ascetic lives of the Cathar hierarchy was also there for all to see. Their popularity and growing support meant that the Church could not simply ignore them. Worse still, the Cathar 'priests' were mostly wandering and evangelical. Where they settled down, they did so in the centre of communities, not in hermit cells in the middle of nowhere. They led by example, becoming in effect living critics of the existing clergy. They were mercilessly hounded and suppressed by the Inquisition. In fact, the Inquisition was invented to deal with Cathars. The Church could not pursue the Cathars for the exemplary lives of their followers but had to pursue them for their doctrinal irregularities. Those irregularities were systematically demonised by the Inquisition in order to justify the barbaric measures taken to supress the Cathars. When reading historical accounts it is good to remember that almost nothing is as it seems to be on the surface. This fact is particularly true of our knowledge of the Cathars. From the Cathars themselves we have a handful of brief documents. From their enemies, however, we have around thirty extensive texts written for the purposes of defaming them, prosecuting them and extinguishing them. Two processes can be seen in the work of the Inquisition, whether consciously or unconsciously applied: Firstly, the theological beliefs and the practices of the Cathars were understood in the ways that the inquisition wanted to understand them – that is, in the worst possible ways, those most shocking to tender orthodox sensibilities. Secondly, their beliefs were twisted and deformed to fit into the heretical categories defined by the Catholic Inquisition. Both of these processes were part of a general process of 'satanisation' of their beliefs – smearing them as demonic extremists – that would create distance between them and orthodox doctrines and leave no room for reconciliation. Our modern word 'demonisation' has had its edges worn down over time and no longer cuts the semantic mustard here. 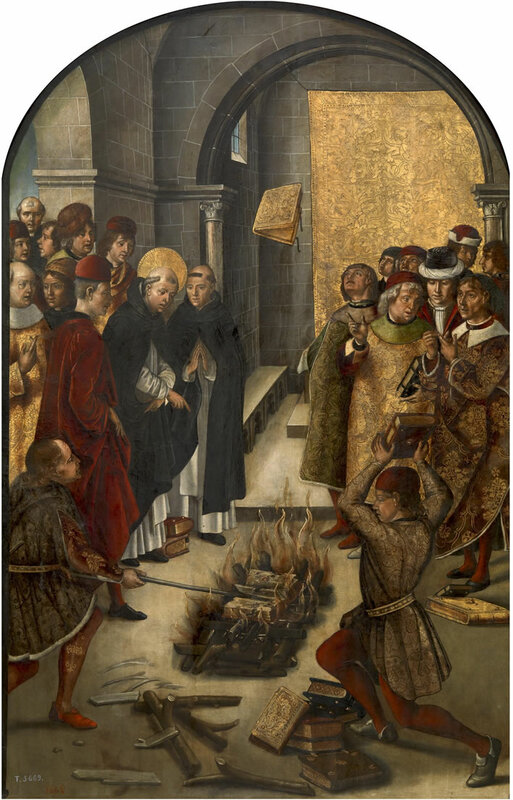 Saint Dominic watches a trial by fire of one of Saint Dominic's books and a Cathar book. The Cathar book is consumed by the flames and Saint Dominic's book floats in safety above the fire. Museo del Prado online. Even the name 'Cathars' was never used by the Cathars themselves, but it's too late to change the name now. The etymology of this non-word from the Greek word for 'pure' is also, put politely, complete fantasy. They called themselves the 'Friends of God', a beautiful title that would never find its way into their enemies' propaganda. Based largely on the propaganda from the prosecution and spiced up with the febrile imaginings of romantics, mystics and conspiracy theorists for over seven centuries the 'Friends of God' have been transfigured into the 'Cathars': a composite image of an extremely pure, spiritual, crazily ascetic, mystic, solar-cult – a latter-day Mithraism with its roots in ancient Persia. Spice it all up with a secret 'Grail', hidden treasure and hermetic symbols if you will. The Cathars can be anything you want them to be; the blank board is yours to write on. From the resulting composite you can pick and mix according to your taste and needs. The short and most accurate description is that they were a Christian quasi-monastic order. There were congregations of believers and followers just as there are in most Christian churches. Their beliefs were in one way or another grounded in the New Testament. There was a hierarchy, but in effect this was more of a monastic than a priestly hierarchy. The normal person could participate, but to join the order one took a vow – called the consolamentum – and went through a form of baptism consisting of the laying on of hands. The vow committed to an ascetic, vegetarian and chaste lifestyle with some form of work – not shockingly different from that of many monastic orders. Once we start thinking of the Cathars as a Christian order and not as an alternative theology their attraction for their followers and the motivation behind their formation of communities becomes much clearer. Following this line of thought we could call Montségur a fortified abbey, not the temple of some heretic cult on the top of a hill. One major and refreshing difference from the Catholic orders was that those taking the vow could be male or female. Seven hundred years after the Cathars the Catholic Church is still convulsing on this point. The Cathars were definitely way ahead of the game in this respect. Nor did Cathars themselves use the much touted terms perfectus/perfecta for their monks. Our muse, Clio, still cheering the existence of female Cathars, is further amused by the irony that these terms have descended from Inquisition documents that used 'perfect' in the sense of hereticus perfectus 'perfectly heretical' not 'perfectly pure' – as opposed to the laity, who were imperfectly heretical and might revert to the faith. The appellation 'perfect' for the members of the order who had taken the consolamentum vow did not therefore refer to the perfection of a state of grace they had achieved but to the perfection, the irretrivable completeness of their damnation in the eyes of the Inquisition. In order to avoid perpetuating this misunderstanding and also to step aside from all need to juggle the masculine and feminine singular (perfectus/perfecta) and plural forms (perfecti/perfectae) in all possible grammatical cases – perhaps there is a reason that Latin is now a dead language – let's call the ones who had taken the consolamentum vow 'cenobites', which applies to any member of a monastic order, male or female. Just as with the word 'perfect', the name 'Cathar' was not used by this heretical group. Those who had taken the 'consolamentum' vow were called 'Friends of God', 'Good Men', 'Good Women', 'Good Christians', sometimes simply 'Christians', because of course, just as with Catholics, it is baptism that makes a Christian, in this case by the laying on of hands. Ceux et celles qui avaient reçu le consolament étaient dits « Amis de Dieu », « Bons Hommes», «Bonnes Dames», «Bons Chrétiens», «Bonnes Chrétiennes», parfois simplement «Chrétiens» et «Chrétiennes », puisque, aussi bien, comme chez les catholiques, c’est le baptême qui fait le chrétien, en l’occurrence, ici, l’imposition des mains.